I don’t know how old most of you were when Star Wars came out, but I’m sure most of you saw it. Does everyone remember the scene where Chewbacca and R2-D2 play that holographic chess game? Well, now you can make your own holograms with the help of this innovative kit. It seems like some kits have been around for a little while, but who knew you could make holograms at home? Not me. This kit has everything you need to make an actual 3D laser hologram included, and it doesn’t seem like the process is too difficult, it actually seems easy enough to be done for say, a school project. Once you get the kit home, you can start making holograms right away! Check out the video HERE . With Litiholo Film, NO processing and NO chemicals are required. 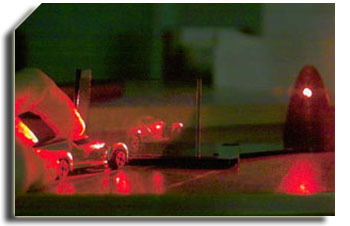 To make a hologram, laser light is split into two different beams. One is reflected off of an object onto the film, while the other beam goes directly to the film. The two beams meet on film, causing a patterns of light and dark lines. The film captures this pattern, which is the hologram. Then, in order to view it, remove the object and turn the laser light on again. You’ll see an amazing 3D image, as if the object is still there. You can also add an Upgrade Package, available separately, for increased capabilities. Includes a 10-pack of film at no extra change. Extra film is also sold separately. Lithiholo refill Pack includes 20 – 2′ X 3″ glass plates for making even more holograms. The Amazon App Store – Coming Soon?